Have you ever wanted to own a home, but you’re scared of the financial burdens of doing so? Well the Federal Housing Administration FHA home loan program might be able to help you. You might have seen all of the stories in the media about Americans losing their homes and being subject to foreclosure; even after the home is foreclosed, the lender will still go after the borrower for any monies not recouped from selling the foreclosed property. Buying a home can be a risky decisions for it can be expensive to meet the financial obligations of owning a house. And home ownership can be even riskier when you take out a mortgage to buy a house. You probably have a lot of questions concerning the FHA Loan program. Here is a compiled list of common question one may have about the FHA mortgage. 1. What is the Federal Housing Administration FHA home loan program? Federal Housing Administration FHA home loan program, is a government program that assists people in getting home loans. FHA program offer consumers greater home loan terms than traditional lenders do; the FHA requires lower down payments, greater borrowing limits, loan back up and many other features that banks with traditional loans don’t offer. The FHA program is much more feasible than taking out a traditional mortgage. The main goal of the FHA program is to encourage more Americans to become homeowners by reducing the barriers to home financing. 2. What makes the FHA Loan program different from a traditional loan? The FHA loan program in Florida differs from traditional loan programs because the FHA aims to give everyday people greater access to home financing with very little risks. With a traditional home loan you would borrow the amount of money you need from the bank to purchase the house and you would repay the loan plus interest in monthly installments to the lender. If you fall behind on your loan payments then the lender will cease the house from you as collateral and sell the house to recoup the unpaid portion of the loan. Basically, when a property becomes foreclosed the borrower not only looses ownership of the house but the borrower looses funds that he or she invested in that home (i.e property taxes, mortgage payments, property maintenance, etc). The FHA program reduces risks for potential home buyers by giving borrowers larger loan limits, a low down payment, and reduced qualifying criteria. 3. What happens if the property forecloses? If the property forecloses the FHA will pay the bank the balance that is due on the home. Then the FHA will take ownership of the home and they will sell the home. The benefit to you as the consumer is that you walk away from the home without the financial burden of owing the bank any money. 4. How much does the FHA require for the down payment? The down payment is based on the cost of the property among other factors. But the FHA allows you to make a down payment as low as 3% the cost of the property. On the other hand, traditional lenders want borrowers make a down payment at least 10% the cost of the property. 5. Would having having Bad Credit make on ineligible for an FHA Mortgage? Having bad credit should not impair your eligibility for an FHA mortgage. The most important thing for you to do is to speak to a counselor at an FHA affiliate bank to find out what your options are if you have poor credit. It is important to mention that the FHA is most concerned with you having stable income and being able to make the monthly payments. What use is having good credit when you don’t have a job or source of income? If you do have poor credit you should still focus on repairing your credit. 6. What are the overall benefits of the FHA program? Overall, the FHA program gives potential home buyers greater benefits than traditional lenders. Home ownership is an investment and in the unfortunate case that you fall behind on mortgage payments and your home forecloses, then you lose all of the money you invested in your property. The FHA program gives Americans better access to home financing. Unlike traditional lenders, the FHA will give individuals with bad credit an opportunity to obtain a loan. 7. 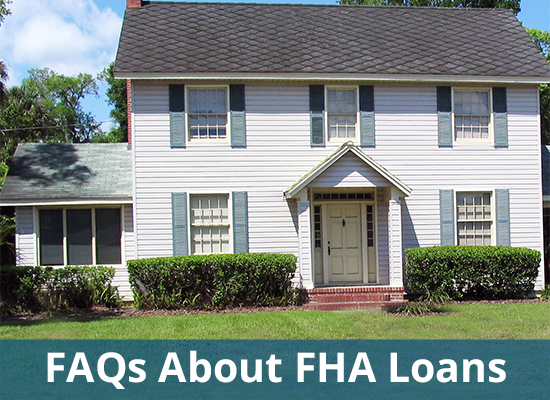 Where could one get more information about the FHA program? Contact us today to learn more about FHA Loans in Florida.